Many Ely visitors travel back home with a liberal dose of fond memories and copious canisters of exposed film from a fantastic train ride aboard the Nevada Northern Railway. They've experienced the "operations" portion of the historical, operating railroad museum. But what about the "historical" element? What have they learned to connect with the abundant history of Ely and White Pine County that lies behind the contemporary rail excursions? Remember the acclaimed television documentary series Connections hosted by James Burke? He wove a web of knowledge, taking seemingly unrelated events, innovations, people, and ideas and fitting them like pieces of a puzzle into a history of invention and technological change. You may have thought you were learning about science -- and you were -- but you were also learning about the history of science. Certainly most passengers aboard the Ghost Train will leave with some appreciation of the copper mining history of the railway. Perhaps they will remember that it was Mark Requa, President of the Eureka and Palisade Railroad, who organized both the Nevada Consolidated Copper Co. and the Nevada Northern Railroad in order to exploit the rich copper deposits of the area. The copper ore had both an intrinsic value and could serve as a source of haulage revenue for his railroad. But what if we dig a little deeper? Do visitors know that Senator William A. Clark of Montana was one of the early investors in the West End properties that would eventually be organized as Consolidated Coppermines? This is the Clark who subsequently built both the San Pedro, Los Angeles and Salt Lake Railroad (later Union Pacific's Salt Lake Route) and the Las Vegas and Tonopah Railroad. He is largely responsible for the early development of Las Vegas. He's the "Clark" in Clark County, Nevada. Do tourists appreciate that the brothers Guggenheim had a substantial interest in the NN Railway even before its completion? Solomon R. Guggenheim, President of the NN from 1918-1934, reportedly occupied that office so that he would qualify for a private railroad car. His private varnish, NN 100 2nd, is still operational and resides at Ohi-Rail's Minerva yard under private ownership. By the way, he's the "Guggenheim" in the Solomon R. Guggenheim Museum in New York City. Connecting yesterday with today Locomotives 93 and 40 face a new day. Do guests of Ely learn about Daniel Cowan Jackling, the mining and metallurgical engineer who revolutionized the copper mining industry early in the 20th century by pioneering and developing the processing of low-grade porphyry copper ores? There would not have been a Nevada Northern Railway without his vision of open-pit mining methods. He succeeded S.R. Guggenheim as President of the Nevada Northern. His first private railway car, Cyprus I, is currently part of the Essex House restaurant in West Orange, New Jersey. Visitors may also want to connect with the Nevada Northern Railway on their next trip to Illinois. Business car 101 Ely has been restored and is displayed at the Illinois Railway Museum in Union, Illinois. Some forty-years ago, it was their first permanently acquired piece of steam-road equipment; they had previously collected only electric cars. "But, when one of the oldest and most beautiful business cars in existence is offered to you, you don't just turn it down!" Today, the IRM has the largest collection of preserved railway equipment in North America--and the Ely was the first. And finally, lest anyone leave Ely believing that the Nevada Northern was the only railway in the area, they're missing some fascinating history. The Giroux Consolidated Copper Co. (later Consolidated Coppermines) constructed both a narrow gauge and standard gauge railroad for their operations at Kimberly, Nevada. Naturally they had a connection, literally, with the Nevada Northern. Later, Coppermines employed both an 18-inch gauge line with mules to power trains of small ore cars, as well as a 36-inch gauge underground railway serviced by a fleet of electric trolley locomotives. The history of these railways will hopefully be further documented by Kimberly native Walter B. Johnson in his next book, a companion to his previously published Copper Camp Kids. 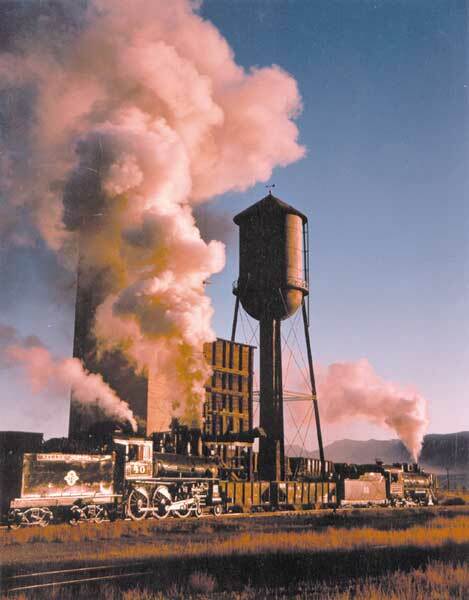 The Nevada Northern Railway, on the National Register of Historic Places, is the best preserved, standard gauge short line and complete railway facility left in the United States. The adjoining Nevada State East Ely Railroad Depot Museum houses perhaps the most complete paper record of any North American railway and, according to curator Sean Pitts, "ranks among the top ten of any collection of company records in the United States." Additional resources await at the White Pine Public Museum, White Pine County Library, and the White Pine Historical & Archaeological Society. Together, they add up to a world-class repository of history and connections that extend far beyond city, county, or even state boundaries. James Burke noted, "There is always a connection but, if the link has never been made before, nobody knows it's there." The connections are all there in White Pine County, waiting to be made. And once visitors experience the connections, they'll be hooked. Believe it--I speak from personal experience!